The Law Foundation's "Favorites of 2018" continues this week with our health-related favorites. You can help us continue to use the law as a tool for change by making a gift to the Law Foundation today. Your end-of-year support is greatly appreciated and will help increase access to justice for our most vulnerable communities in Silicon Valley. Learn more about the health-related issues affecting our clients and community by checking out the list below. Also, click here to subscribe to our newsletter to receive the latest updates from the Law Foundation straight to your inbox (including lists like these)! Based on a true story, this film explores an uphill legal fight for a patient's rights that led to Riese v. St. Mary's Hospital and Medical Care Center. In this case, brought in the name of Eleanor Riese by the California ACLU, the California State Court of Appeals declared that patients in involuntary mental health treatment have the right to exercise informed consent in most cases regarding the use of antipsychotic drugs. This case still governs the hearings conducted by the Law Foundation's Patients' Rights Unit and established a legal standard for determining capacity to refuse psychiatric medications that are used nationally and around the world. Featuring an award-winning cast, including Helena Bonham Carter and Hilary Swank, this film tells an inspiring and heartfelt story of friendship and combating mistreatment. Watch here. 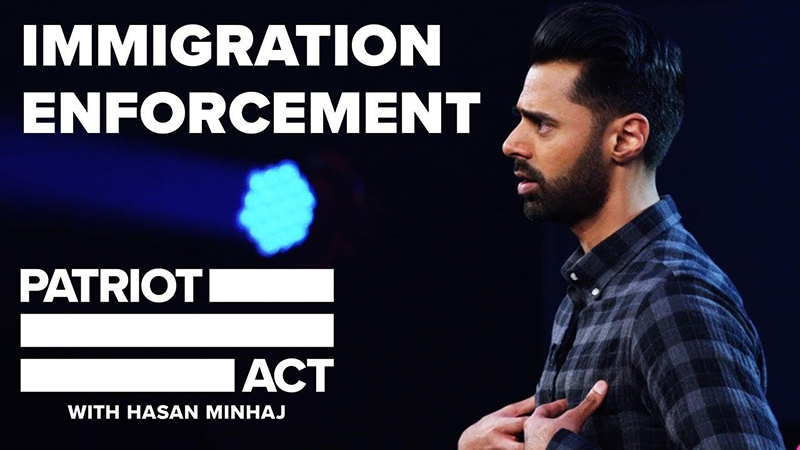 Comedian and host of the Netflix show "Patriot Act," Hasan Minhaj analyzes and contextualizes United States' xenophobic immigration policies by exploring the history of Immigration and Customs Enforcement (ICE) and other issues that contribute to the current anti-immigrant climate, shown most recently through the example of the Central American caravan. Using data from The Marshall Project, Minhaj uses facts and humor to demonstrate how U.S. immigration policies are broken. As one of several co-counsel representing immigrant minors in the Flores Settlement Agreement, the Law Foundation helps ensure the standards that govern length of time and conditions in which migrant children can be held at federal detention facilities are enforced. Watch here. This year's theme for World AIDS Day, on December 1, was "Know your HIV status." A new report from UNAIDS (Joint United Nations Programme on HIV and AIDS) found that about 9.4 million people are likely HIV-positive and don't know it. The UNAIDS also just launched a global partnership to eliminate HIV-related stigma, which continues to be widespread around the world. People living with HIV experience discrimination based on their gender, gender identity, race, ethnicity, age, sexual orientation, and immigration status. Our Health Program provides services to people living with HIV to ensure that discrimination like this doesn't undermine their rights, including access to health, work, and a stable income. Read here. Race and racism can be difficult topics to talk about if they're not part of someone's daily life experience, but this book is for everyone. Oluo takes an accessible and approachable avenue to address the most sensitive and charged issues in the United States regarding racial disparities and oppression by being straightforward and funny. From white privilege to police brutality, this New York Times bestseller breaks down the systems of power, how they work to perpetuate and uphold racial oppression, and how each of us can do our part to help dismantle them. Read this review from the National Book Review.